Created by the Diesel Brothers with a patented TeaCrine® formula for sustained, all-day focus and energy to help you crush the day. We wanted to create an energy drink that would give us the boost we needed with none of the crash. We are proud of every truck that comes out of the DieselSellerz shop, and we wanted to have the same pride in our new energy supplements from Torque. Our patent-pending TeaCrine® formula keeps you going all day with none of the jitters. It extends the effects of caffeine. It delivers energy, mental clarity with improved motivation and mood. 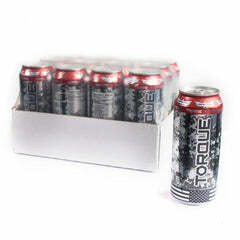 Whether you are looking to crush it at work or in the gym, Torque Energy is the only can that will give you the all-day rush of energy your body deserves. It’s the only energy boost we trust in our shop and in our bodies. Grab a case today and find out why. Who Are The Diesel Brothers? As seen on The Discovery Channel, The Diesel Brothers follows The DieselSellerz team as they build and restore extreme diesel trucks to give away. What is Folds of Honor? Since 2007, the Folds of Honor has carried forth this singular, noble mission. To provide educational scholarships to spouses and children of America’s fallen and disabled service-members. A portion of ALL of our proceeds will be donated directly to Folds of Honor. There was something wrong with my order, who do I talk to?